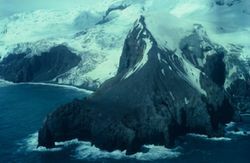 Bouvet Island is an uninhabited 58.5 km² volcanic, mostly inaccessible, island in the Southern Ocean, south-southwest of Cape Town. It is thought to be the most remote island in the world. The nearest land is Queen Maud Land, Antarctica, which is over 1,750 km (1,090 mi) away to the south. This uninhabited volcanic island was discovered in 1739 by a French naval officer after whom the island was named. No claim was made until 1825 when the British flag was raised. In 1928, the UK waived its claim in favour of Norway, which had occupied the island the previous year. 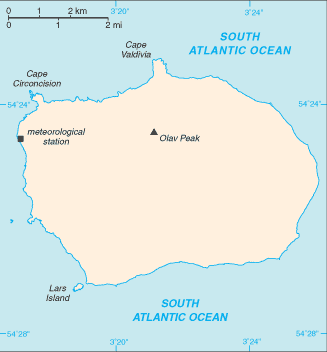 In 1971, Bouvet Island and the adjacent territorial waters were designated a nature reserve. Since 1977, Norway has run an automated meteorological station on the island. Since the entire island is a nature reserve, it's likely that you will be denied entry permission, if the purpose of entering is just tourism - although usually you won't find any Norwegian immigration officers in the island to refuse your entry! But, if you absolutely have to get there anyway, your best bet is to try to find out when the next research expedition is scheduled to get there and ask if you can join them. If you have a useful occupation or skill, such as Arctic research biologist, research geologist, helicopter pilot, or physician, you will probably be welcome. There's been at least one case of this happening in the past, when a bunch of radio amateurs were allowed to enter the Island for a DXpedition (setting up an amateur radio station there to communicate with people across the world). Oceanwide Expeditions  explores the most remote places in and around the South and Mid-Atlantic Islands with their own ships and expedition crew. Passengers are taken from Ushuaia to remote locations such as Bouvet Island. Other locations are the South Sandwich Islands, Ascension Island, Tristan da Cunha, Cape Verde and St. Helena. With fully equiped zodiacs passengers are going ashore on several islands, which are rich in wildlife and offer plenty of opportunities for exploring activities. There is nowhere even remotely usable as a harbour, although it is possible to anchor offshore. If you are willing to put your life at risk, you might try using a light boat with outboard engine to enter. It has been known to work, but plenty of people have tried and decided it was not worth the risk. In theory, it should be possible to land on the island using a large, dual engine speed boat, as there is a small beach in the North Western corner of the island. It would, however, require extraordinary bravery and considerable boating skills to avoid sinking the boat before reaching shore. There is little to see on this island. Because of its latitude, remoteness, and temperature, the is virtually no recreational activities on Bouvet Island. There is no accommodation on Bouvet Island. The only permanent structure is an automated weather station. For some obscure reason the Internet Assigned Numbers Authority gave it its .bv own top-level domain (even though it is very unlikely that anyone will ever actually live there). Because of this, Norway - the country that administers the domain - has decided that the .bv domain will remain unused. The frigid temperatures, high peaks, oceanic cliffs and remoteness can be extremely dangerous. It would not be advised to go here without proper equipment if an injury occurs. The nearest hospital is thousands of miles away.